Source of this picture: Chicago Tribune, 7/7/1965I got interested in this book because here in Perth, every few weeks when waiting for my morning bus I bump into an older South Korean gentleman. We got to talking and turns out, he's a veteran of the Vietnam war! Until then I didn't even know that South Korea was involved there (as were other unexpected countries: Australia, New Zealand, Thailand and the Philippines). He doesn't really talk about his time there (obviously, it was the same with my Wehrmacht grandfathers), but I thought I might have a look at books from the South Korean perspective in Vietnam, in order to perhaps learn more about him (he's fun - he takes the bus to study English in the city library, his wife dresses him exclusively in H&M clothes, imagine a student-hipster in his mid-70s).So here's a book about the Vietnam War from a South Korean!What a complicated book! Is it a novel? It doesn't really have the structure of one, there's no real story arch, no main characters but several interwoven and connected characters, a lot of it is infodump... Is it autobiography? Is it a documentary? I guess all of that. It's almost non-fiction.Set mostly in and around Da Nang during the Vietnam War and (in the beginning) following a South Korean soldier who has been assigned to an investigative branch, tasked with keeping tabs of dealing of arms and food rations . Since the US army had (and still has) practically unlimited money their base exchanges are full to the brim - the exchanges are staffed by bored young men looking to have a good time, from there it follows that these things are leaky sieves. You first think it's only the South Korean Ahn Yong Kyu who's the main character, but the book soon branches out - other 'branches' of the story concern a young Vietnamese man who joins the Viet Cong and becomes their weapons buyer in the markets, another branch concerns a general's aide-de-camp who uses his power to stuff his pockets with money, yet another (short) branch concerns an AWOL American soldier who's trying to leave the country... all these branches are interconnected. The 'main characters' pages at the start of the book lists 22 main characters.It's not a typical war book since most of the book is concerned with the power struggles and the flow of information in the Da Nang markets - but there are a few tremendously dark and depressing 'war interludes', I guess you could call them. They are interview protocols from the US army concerning war atrocities committed by US soldiers on civilians (a young girl raped and murdered, the My Lai massacre, a young boy tortured to death, all perpetrated by US soldiers), the interviews are preceded by recommendations of what should happen to the perpetrating soldiers (usually: 'demote by one rank'), these parts are short gut punches out of nowhere. Then it goes back to the markets, there is rarely any 'action'. Only towards the last 100 pages or so do things start to happen.I think Hwang Sok-yong used this book to document his memory from the time in Vietnam, and since the book is very much concerned with documenting what happened in the Vietnamese underground market a whole lot of writing is dry (is it the translation? I don't think so! ), example, from a conversation of two Vietcong agents:“But what we have our hearts set on are the new carbines, M1s and M2s, to be supplied to arm the militias in the new hamlets.” “My brother would never get involved in such risky business. He’s a very cautious man, sir.” “I’m not saying you should talk to your brother about this. Make friends with Lieutenant Kiem on the adjutant’s staff at the provincial government office. I’m certain he’s now scheming to find a way to develop some business of his own. The money that falls into his lap for helping Major Pham is chicken feed. As far as I know, militia matters are under the jurisdiction of the ARVN Second Division, but since their headquarters are up in Hue, the commander who should be in charge has no practical control. A captain dispatched from First Division Headquarters, along with Colonel Cao, superintendent of military police in Da Nang, will be delegated power to conduct the training and take command of the militias. Lieutenant Kiem, I think, will be responsible for liaison between those concerned.”As you can see, very political, and I didn't cherry-pick, large parts of the book are like this. But that's the situation it described - not only did you have several political factions, each faction has their own subfactions (for example, South Vietnamese traders selling arms to the Viet Cong) with their own goals, all of them scrambling for money, and with capturing that Hwank Sok-yong succeeded. It's just not much fun to read, but you learn so much! Except about my South Korean friends' experiences, chances are he wasn't involved in black market dealings.Recommended for: ???????? Hwang Sok-yong is among the most celebrated of Korean authors. He won the prestigious Daesan Prize in 2001 for his novel “The Guest”, an unflinching portrait of a North Korean massacre during the Korean War, and at one time or another has won most of the significant literary prizes this country has to offer. An outspoken critic of several Korean governments and a prominent dissident, he is also one of Korea’s most politically engaged writers. In 1964 he was jailed for labour activism. In 1989 he violated the National Security Law by travelling to North Korea where he met with Kim Il-sung. After this, Hwang spent several years in exile in New York and later Germany before returning to South Korea to face a seven year prison sentence.Now in his mid-seventies, he continues to criticise the Korean government, recently attacking Park Geun-hye’s administration over its handling of the Sewol ferry incident. Throughout a long career Hwang has regularly mined his personal experiences and political beliefs for his fiction. Such is the case with the new English translation of “The Shadow of Arms” which draws on his experiences as one of the 300,000 Korean soldiers sent to fight alongside American troops in Vietnam. “The Shadow of Arms” is both an atypical war novel and an unconventional exploration of Korea’s involvement in the conflict. There is very little combat in this almost 600 page novel set entirely in a war zone. Instead the focus is on the black market dealings that occur in Da Nang as a result of the conflict – the thriving black market being the dark economic shadow cast by the war, and the intersecting lives of several Korean, American and Vietnamese characters who seek to profit from them.The novel focuses on three key characters; Ahn Yong Kyu, a young Korean sergeant taken from the front lines to work with the Criminal Investigation Division and tasked with investigating backstreet dealings; Pham Minh, a young Vietnamese man who joins the National Liberation Front and fights against the American army; and Pham Quyen, Minh’s older brother and a commander in the Vietnamese army fighting alongside the Americans. The other main “character” is Da Nang itself, with Hwang bringing the sights, sounds and smells of the coastal city to vivid, evocative life. Hwang creates an intricate, richly detailed world of shady backstreet deals and dubious characters trying to exploit one another and reveals the cut throat economic consequences of war in a foreign land. I had high hopes for this novel. It's almost 600 pages and I made it to page 250 or so. The role of mercenary (or conscription by different means) Korean soldiers in America's war with Vietnam is a subject that keenly interested me, and I looked forward to a completely different perspective on a war that, in my mind, has little left to offer in terms of a subject for fiction. The Korean author was persecuted in his home country for his writings but subsequently won high literary honors there. I had never heard of him.The length of the novel was my main, but significant, issue. The novel's subject, the black market in arms, materiel, and wartime and consumer goods during the war is unique but the plot bogged down and I found it impossible to continue understanding who is doing what to whom. Although that could have been a fine characteristic (loyalty knows no bounds in the black market), it proved confusing instead. No single character stood out to grab my sympathy or empathy. I could not anchor myself in the story, nor did it carry me to parts known or unknown. Other issues were in translation, or seemingly so. Whole paragraphs read like non-fiction. Some of the history of the conflict and the Korean role was repetitive. A book half the length of the one before me seemed more appropriate.Still, I respect the publisher for taking on The Shadow of Arms. The subject is a very important one even if it, in my mind, did not translate to the novel form all that well. Bringing these perspectives to English-reading audiences is vital. 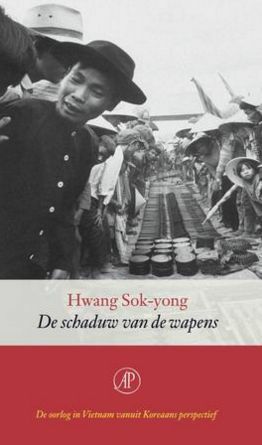 Hwang Sok-yong Remco Breuker Imke van Gadingen - 소설가 황석영He was born in Hsinking (today Changchun), Manchukuo, during the period of Japanese rule. His family returned to Korea after liberation in 1945. He later obtained a bachelor's degree in philosophy from Dongguk University(동국대학교).In 1964 he was jailed for political reasons and met labor activists. Upon his release he worked at a cigarette factory and at several construction sites around the country.In 1966–1969 he was part of Korea’s military corps during the Vietnam War, reluctantly fighting for the American cause that he saw as an attack on a liberation struggle.